As one of the top celebrity investors in the industry, Tony Leung Chiu Wai (梁朝偉) and wife Carina Lau (劉嘉玲) are one of Asia’s richest stars. Over the years, the couple have invested on various businesses and real estate. It is said that the couple has a combined wealth of over $1.2 billion HKD. With their fortune, both Tony and Carina have semi-retired from acting. Tony has not filmed a movie project in two years, his last work being Wong Kar Wai’s (王家衛) 2013 kung fu film, The Grandmaster <一代宗師>. Carina, on the other, would occasionally make supporting appearances in various big-budget films. Nonetheless, the couple are grounded and humble. They spend modestly and do not show off their wealth. Tony, in particular, leads a very private life. The actor, who prefers traveling alone, was recently spotted in Jordan’s Temple Street, doing some light shopping. He then boarded an MTR train to Admiralty, where he went to a supermarket. He was dressed in all black, and wore a face mask and a cap. Tony ate dinner alone, spending no less than $200 HKD for the meal. He then went to a nearby HMV store to look at some CD’s and DVD’s, but did not purchase anything. 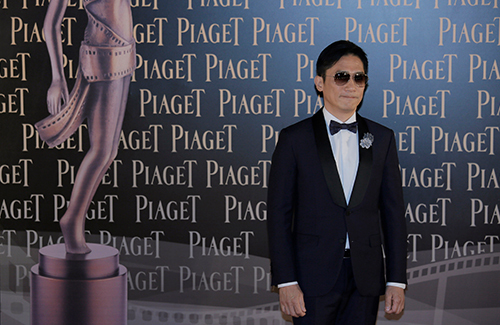 The 53-year-old award-winning actor has been spending his life comfortably and freely in the last few years. In the beginning of the year, he traveled to India to meet with His Holiness, the 17th Karma Ogyen Trinley Dorje. After returning to Hong Kong, he attended to several public events, but has since retired from the public eye. This article is written Addy for JayneStars.com. Sounds like another Chow Yuen Fatt to me! Respect! He’s not the only frugal movie star. Wang Leehom, Takeshi Kaneshiro, Jerry Yan and Aarif Lee are also careful about not wasting money and clothes. Yup loving the down to earth crowd too. And those that can still enjoy and appreciate the simple pleasures of life, which are sometimes the most meaningfully enjoyable. Secure enough people who don’t need to wastefully flaunt wealth and labels so they can proclaim to the world “look how much I spend, and how important I am”. Money saved by not throwing in designers’ pockets can be more usefully channeled towards the really needy causes in life. His cheap $40 meal probably tasted better and was enjoyed more … than some artistically-arranged $400 hotel plate (where people sit on eggshells, on best behaviour so they can be seen and heard). but these are extraordinary, talented and handsome guys. @msxie0714 So true! Jacky Cheung is another artist who “recycles” his clothes a lot — every time he makes a public appearance, there’s usually a part of his outfit that is from 10 to 15 years ago (whether it’s shirt, pants, jacket, shoes, etc). Sometimes us fans even notice that he’s wearing a similar outfit that one of his buddies such as Tony Leung or Nick Cheung wore to a previous event (in which case we like to joke that they went shopping together..hahaha). Definitely lots of respect for these artists who are able to put their star status aside and live frugal, ordinary lives. Its refreshing to learn all these stars are living a frugal lifestyle. Hope they are all using their wealth to donate to worthy causes as much as they can. That will earn everyone’s respect. I agree and it is great that some wealthy celebs do not let fame and fortune get to their head. As far as I know Tony and Carina have their own charity called TLC which helps put the needy. Carina once joked that TLC meant Tony Loves Carina. They are a sweet couple and I have loved them from the beginning. It is great that they are so humble and grounded. @hetieshou meant to say helps out the needy. Gosh I need the edit button! What happened to it?